The information presented on this page was originally released on March 31, 2005. It may not be outdated, but please search our site for more current information. If you plan to quote or reference this information in a publication, please check with the Extension specialist or author before proceeding. It won't be long now until landscapes across the state are alive with color. Certainly the azalea will be putting on its usual show, but so will the 2005 Mississippi Medallion Award-winning Chinese snowball viburnum. There are a lot of good viburnums, but with its white, snowball-like flowers, the Chinese snowball (Viburnum macrocephalum) is the showiest. This plant is always for sale but in small quantities, rarely meeting demand. 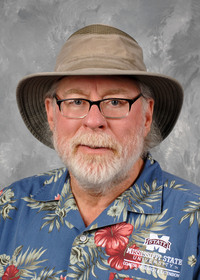 The Mississippi Plant Selections Committee chose this old-fashioned plant a winner not only because it has stood the test of time and is superior, but also because it needed to be put back into production at a quantity deserving of an outstanding landscape performer. In previous years the committee has chosen other old-fashioned plants like the lilac chaste tree, or vitex, and the native oakleaf hydrangea. So when you start shopping this spring at your local garden center, in addition to looking for the "latest and greatest," look for a plant that is an heirloom and a 2005 Mississippi Medallion award winner, the Chinese snowball viburnum. The snowball viburnum produces 6- to 8-inch glistening white blossoms. A close examination shows the bloom is really made of dozens of 1_ -inch florets. The blossoms almost resemble a cheerleader's pom-poms. While three or four flowers would make a dramatic statement, know that the Chinese snowball produces them by the scores. It might make you wonder how the plant supports all of the huge blossoms. The Chinese snowball is a large shrub, well suited for large gardens where it can be enjoyed from a distance. It can reach 10 feet tall in five or six years. It's evident that Mississippi gardeners love the snowball because it often receives a prime spot in the middle of the front yard all by itself. Without a doubt, it commands attention in this situation -- especially when it blooms. Aesthetically speaking, I prefer to plant it behind or in combination with azaleas. 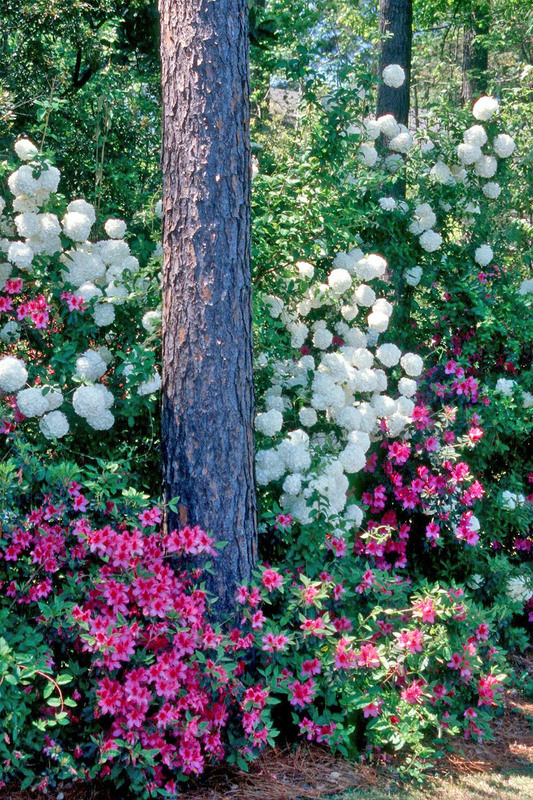 It performs best in the same moist but well-drained shady environment where you would grow an azalea, and it makes an incredible companion plant, usually blooming in sequence with the Southern Indica azaleas. 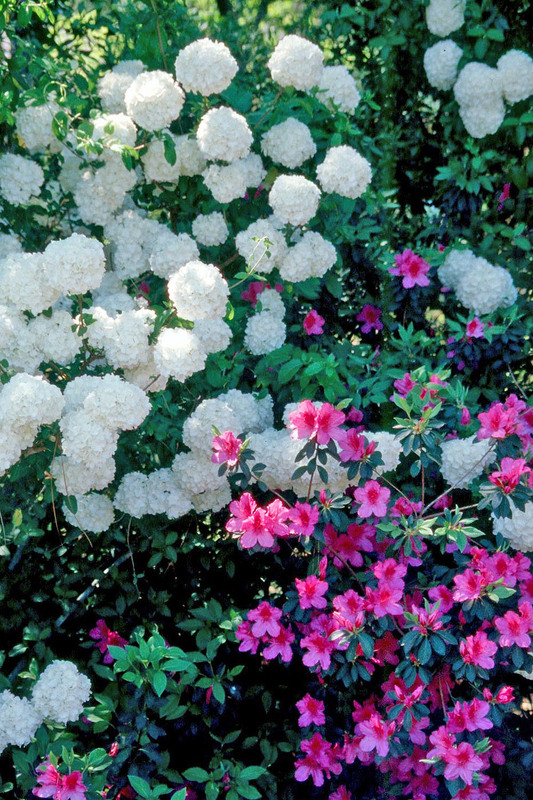 Prepare a bed for both azaleas and viburnums by working in 3 to 4 inches of organic matter like compost or humus. Another good option is to plant on raised beds and bring in prepared landscape planting mixes available at most garden centers. Dig your planting hole two to three times as wide as the rootball but no deeper, planting at the same depth it is growing in the container. As you prepare the soil, incorporate 2 pounds of 5-10-5 fertilizer per 100 square feet of bed space. Feed about four weeks after planting with a slow-release fertilizer like a 12-6-6 or balanced 8-8-8 at a rate of 1 pound for the same area. There will be a lot of choices when you shop this spring at your garden center. I hope you will look for the Mississippi Medallion Award-winning Chinese snowball viburnum.